The games that children play today are very different from the ones that your ancestors played when they were kids. Many of these simple games have survived through the ages, but may have wained in popularity. You may have played some of them without realizing how old they actually are. Here is a brief history lesson about some of the games that your ancestors enjoyed. Jacks is a game of skill that looks deceptively simple to play. Sit on the ground, and scatter the ten jacks in front of you. Start by tossing a small ball into the air, grabbing one jack, and catching the ball. Do it again, only this time, pick up two jacks. Repeat this process until either you miss the ball or you grab the wrong number of jacks. Now, it is the other players turn. The game goes as far back as Ancient Greece. Originally, it was played with stones that were tossed up and caught on the back of the hand. It was a game played by women and girls. There have been many variations on how to play jacks. If you are going to play marbles, the first thing you need to do is sit on the ground. Use chalk to draw a circle that is two or three feet wide. It requires at least two players. 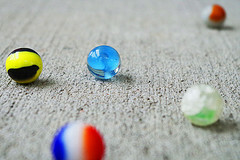 Each player puts several of his own marbles into the circle. When it is his turn, each player uses a larger marble (that is called a shooter). He must flick the shooter marble out of his fist and towards the marbles that are in the circle. That player gets to pick up any marbles that he managed to push out of the circle. If you were playing “for keeps” you ran the risk of losing all your marbles. Mental Floss a great article about the game of marbles. It includes a lot of the slang that goes with the game. It appears that no one is entirely certain exactly when the game of marbles originated. However, there have been marbles found in the tombs of ancient Egyptians and the ashes of Pompeii. Some Native American tribes also played marbles.